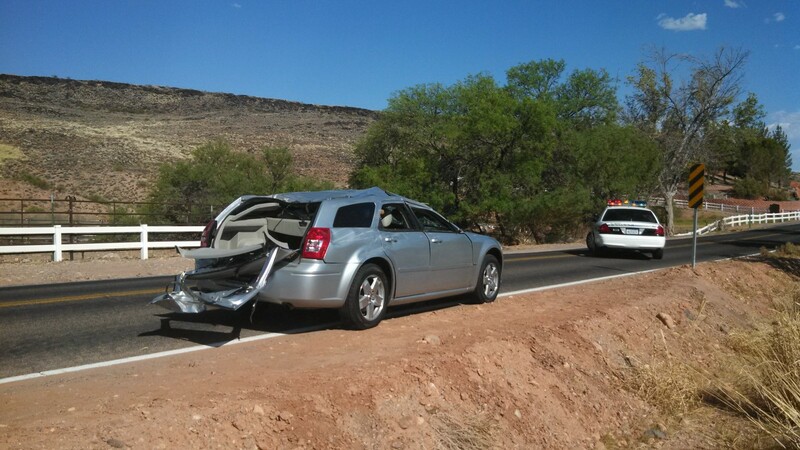 ST. GEORGE – A test drive took an unexpected turn for three people in a 2006 Dodge Magnum when a cottonwood tree on the side of the road attempted to hitch a ride Saturday afternoon. 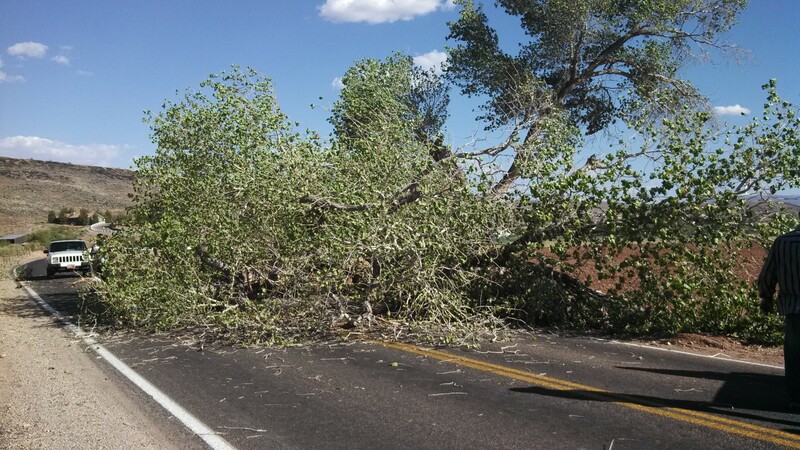 At around 5:12 p.m., Amparo Chavez, an employee of Premier Car & Truck, was driving the car westbound on Indian Hills Drive near Gubler Lane with two customers, an adult male and female, when a large cottonwood tree suddenly split in half and crashed down on the vehicle. 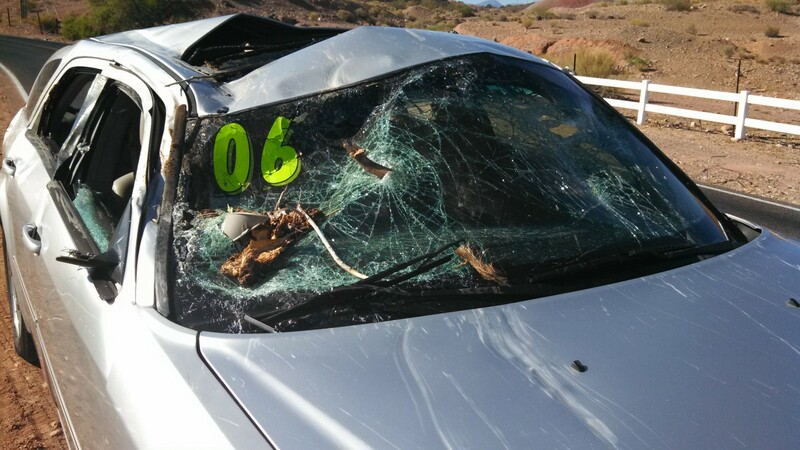 The tree smashed onto the front passenger side of the car, bending in a portion of the roof and destroying the sun roof. The windshield was smashed, with pieces of the tree lodged in the glass. It also caused significant damage to the trunk area. However, Chavez managed to stop the car safely on the side of the road. 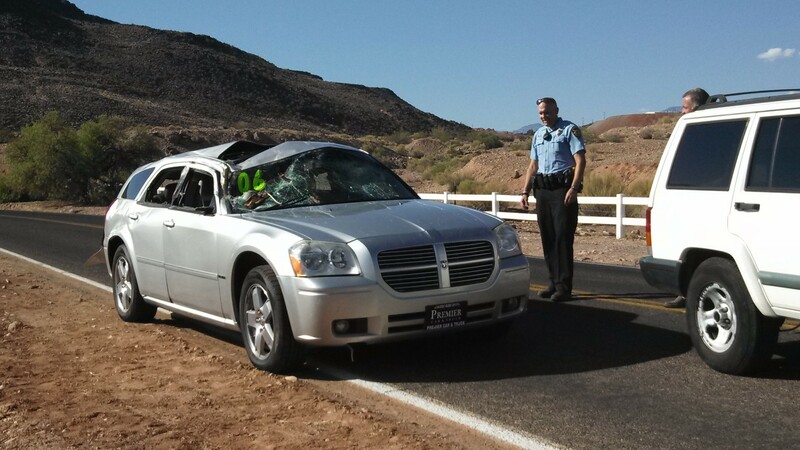 With the exception of a minor cut on the face of the male passenger, the car’s occupants were shaken but unharmed. 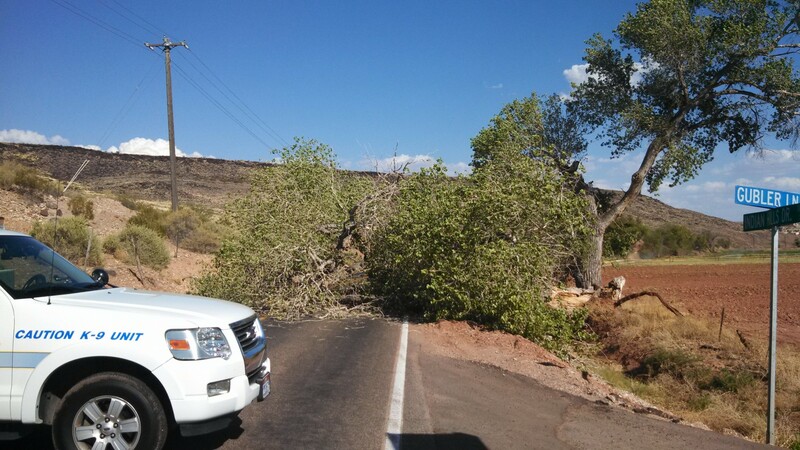 St. George Police Department units arrived on the scene and shut down Indian Hills Drive between Gubler Lane and a private street further down the road so the car could be towed away and the fallen cottonwood could be moved out of the path of traffic. 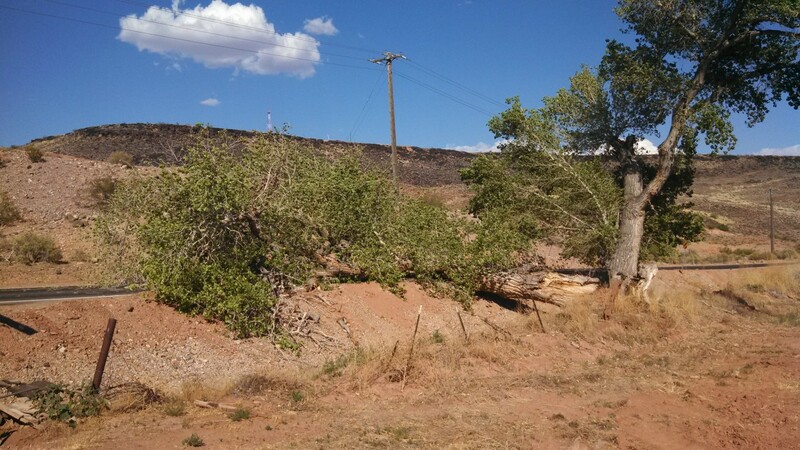 No official cause for why the tree came down has been determined, though property owners at the scene said the cottonwood was rotten, a likely factor. The tree was estimated to be between 80 and 100 years old. SGPD Officer Jeremy Needles said no citations would be given out in an incident like this, which he referred to as a “true accident,” where no one was at fault. 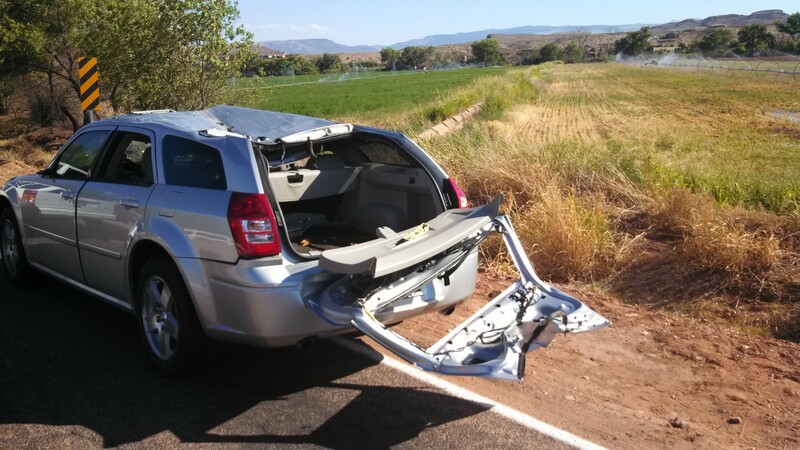 He said it was simply a freak occurrence and he was glad no one was seriously hurt. “Five seconds sooner or five seconds later, they could have avoided (the tree) completely,” Needles said. What a great idea! It might become the first Magnum convertible on the market!!! No sense wasting a perfectly good 5.7L Hemi engine. They changed their mind on the Magnum but are planning on buying our 06 Dodge Charger! 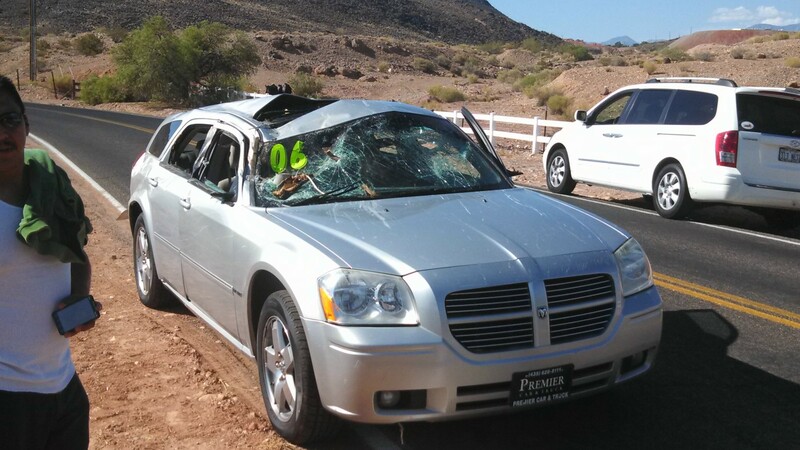 We just took this Dodge Magnum in trade. Not the one that you drove in February, but the same style. The Magnum is a “retro look car” and has the smaller windows. If the tint is dark, that sure makes visibility more difficult, whether you are 5’6′ or 6’1′ like myself. Great cars, but this one has seen it’s better days! That is completely insane – the odds of how untraveled that road is, for the tree to fall on a car!! Talk about karma or..I dunno what u wanna call this!